The big story in the first open race at Nike Team Nationals was Team Kenya from Eldoret with their 24 hour trip from Nairobi to completely dominate both boys and girls divisions at Portland Meadows as the Kenya boys swept the top places, while the girls took the top four, but there was also stories, trips, and accomplishments made by the American kids and teams that competed on Saturday. Neither top finishing American teams or individuals had to travel considerably far to Portland Meadows. At least in comparision to their Kenyan counterparts and other fellow American squads from other parts of the country with a total of 16 states represented. The Washington 4A state champions in Gig Harbor finished out the season fourth in the Northwest Region and also have experience in competing at Portland Meadows as the team competed in the championship division at NTN last year. Their experience on the NTN course and obvious strong team this fall with a state championship showed as the top finishing U.S. team behind the Kenyan team (25 pts) with 90 points. Gig Harbor was led by top American finisher Kesslee Payne with a fith place run of 19:55. Payne was able to catch the fifth runner of the Kenyan team with a pack of runners in the final half of the race. "I wanted to beat at least one Kenyan like anyone does. It was a little bit of a boost," said Payne. Gig Harbor had started the season as a pre-season #1 team in the Northwest, but suffered two regional losses in two unconventionally scored races in September in a flighted race by graduation classes and another race scoring runners through seven runners. The meet in which team scoring went through seven, Gig Harbor was missing their top runner Payne after a reaction to a bee sting that week. The team felt those losses should have not carried as much weight against them and had a chip on their shoulder Saturday to prove they were slighted in the selection process for the regional teams. "We wanted to show what we had and what they possibly didn't see," said Payne. One of the great opportunities that the open race does provide is teams that feel they belong in the NTN championship race can at least show the selection committee that they were deserving in competing on the same course in the same day. Putting up a 20:35 team average in the open race to take second behind the Kenyan team and finish 46 points ahead of the next team showed them to be a very deserving team. Only the top four finishing teams in the championship girls' race ran a faster team average. However, it should be noted that the course was torn up more and continued to run slower after each race at Portland Meadows. It would have been interesting to have seen though how Gig Harbor would have stacked up with the two Northwest automatic qualifiers Billings XC Club of Montana (14th, 21:09 team average) and Fairbanks XC Club of Alaska (15th, 21:10 team average) in the same race. Payne and the Gig Harbor certainly showed no signs of bitterness over not racing in the championship and enjoyed the open race. "It was interesting. I never had really run before with the mud and hay bales. It was just a whole new experience. I just enjoyed it," said Payne. The California boys ruled in the open boys as the depth of the state was very apparent. Ryan Gamboa of Upland finished eighth in his state race in California and ended up being the top American finisher behind the Kenyans in sixth place with a time of 16:44 in the NTN open race. Gamboa broke away from the rest of the American runners early on and ran in "no man's land" for much of the race between the Kenya top five and the rest of the field. "It was muddy and I figured it was going to be hard to catch someone if they get out. My goal was just to get up at the beginning part of the race and stay there. In the middle of the race, I saw the Kenyans and didn't see anyone else, so I decided just to stay with these guys. I didn't know what to expect from them. I thought they had to be good runners, but I didn't know they'd be that great," said Gamboa. The state of California also dominated the team scoring with five of the top six teams with Team Kenya in that fray. The El Toro XC Club, ranked #4 in the final NTN California team rankings, ran sensational in the open race with a 17:13 team average and team score of 100 points to finish second overall. El Toro was coming off a strong state meet as they were only eight points off a state win over eventual NTN runner-up Simi West XC Club (Royal of CA). El Toro also had the fastest team average of the day behind Team Kenya as they were three seconds faster than NTN champion Bridgetown XC Club (Coatesville of PA). However, as mentioned comparing team averages from open to championship races at NTN, the course got progressively worse and slower throughout the day. Decent evidence to suggest though that El Toro would have raced competitively in the championship race. 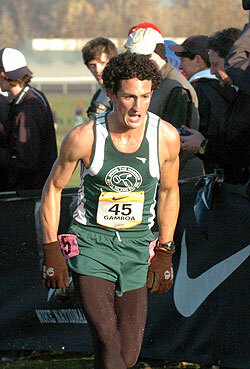 El Toro's top finisher in Anthony Masci (11th, 17:02) was very appreciative that Nike created the open race for the 2006 event. "Its definitely a good thing thats its not just top 20 and anyone can come in and prove themselves. Teams like Dana and El Toro that can have a bad race and not make it in, still can have their opportunity. I think its really a good idea," said Masci. Plenty of discussion and debate circulated on the Kenyans competing at Nike Team Nationals. They were moved from their original planned race in the championship division to the open division, but the competitors in the open races soaked up competing with them and making friends afterwards. "Racing the Kenyans, I went into it really dreading it, but it was really fun to run with them and hang out with them. We were all shaking their hands after the race like they were celebrities." It does not matter if you are a Kenyan, American, runner, coach, parent, or staff, Nike treated everyone like celebrities this past week.